My post marathon reward to myself (one of the many) was a 5 day girls’ trip to Cabo San Lucas, Mexico with eight of my sorority sisters (I was an Alpha Delta Pi at MU). This was a great opportunity to catch up with old friends and become closer to a few girls that I didn’t really know too well. By the end of the trip, we were all definitely feeling like family (sisters, if you will ;-) haha)!! We stayed at the Riu Santa Fe, a brand new all inclusive resort right on the beach – directly across the harbor from Lover’s Beach and the famous Cabo rocks. The food was pretty good, and the tequila flowed like water (without the bacteria). We had a number of pools (with bars) that we definitely took advantage of. The waves on the beach were killer (Kirsten and I got mauled and almost died), but were spectacular and beautiful. 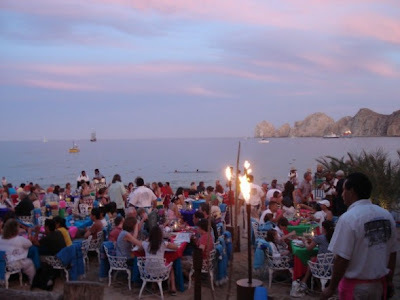 We did some zip-lining (canyoning) in the desert; we kayaked out to Lover’s Beach (and its opposite, Divorce Beach); we had an incredible meal and margaritas at The Office; and spent one fun party night out on the town of Cabo dancing (Cabo Wabo, the Zoo, Squid Row). The weather was fabulous, sunny, warm but not hot or humid. My only complaint was that I think I wore too much sunscreen! I have more tan lines from 5 hours of running the marathon than I do for 5 days in Cabo. Go figure! I don’t have everyone’s pictures yet, but here are a few of my favorites so far. All the girls in the infinity pool. Kirsten dancing on the bridge. Traci and Debbie battling the waves. Me, Jen, Jenny and Lindsey. Pictures of Lover's Beach and Arch. All the girls on the beach. 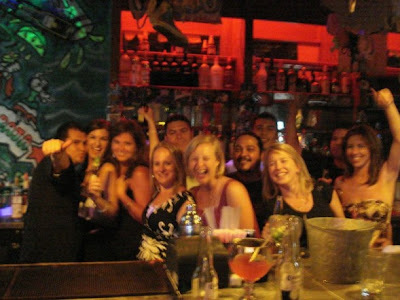 Behind the bar at Cabo Wabo. Looks like fun! What a perfect way to celebrate finishing the marathon. How awesome, Sara! Glad you had a good time and trip. You were most deserving of it. Looks like a fun time and a beautiful place. Now I REALLY can't wait to go on our Honeymoon! Thanks for the link, Sara!